Working is Learning, Learning is Working. Harold Jarche nailed a great point in his article on Learning Management Systems (LMS). Learning is no longer what you do before you go to work, never having to learn anything else in order to do your job. In the 21st century networked economy, learning and working are becoming one. via Harold Jarche » LMS is no longer the centre of the universe. I recently dropped some social networks and I’m on the verge of dropping Facebook. I don’t like the idea of pouring inside someone else’s bucket. I think the real line is desire to be considered a professional. Being a professional means owning your knowledge and the tools that go with it. Whether it is a work or education system, I can’t see leaving my career and personal goals to other people or their software. I’ve been looking at what I have and how I’ve been using it and it was time for a little Personal Technology Tune-up. I went on a little Data diet – sort of. So you have all these places that information comes from, so the next question is where does it go? As I mentioned in the opening of this series, that expecting to use a single tool in multiple situations is a little silly. After trying several ways to do things I ended up with 5 tools that collect information from all my online sources. The longest running tool I’ve been using is Delicious for bookmarks. In addition to being a way of publicly marking useful sources, it has good support through many browsers. I still use it regularly but it tends to be my web archive rather than something I refer to in my workflow. Instapaper is my new workflow bookmarking tool. This is a little different because it actually caches the content of pages for you. This is especially useful in mobile access. I can collect up some pages and view it on my iPhone whether I’m connected or not. Again it is supported well with a bookmarklet in all my browsers and quick links in my feed readers. The idea here is if there is something worth reviewing I can send it to Instapaper which then becomes my ‘to do’ list of web content. Where Instapaper really works well is during the distracting moments in web surfing. When you are searching with a specific purpose and find some content that is compelling frequently you get pulled off your main task. 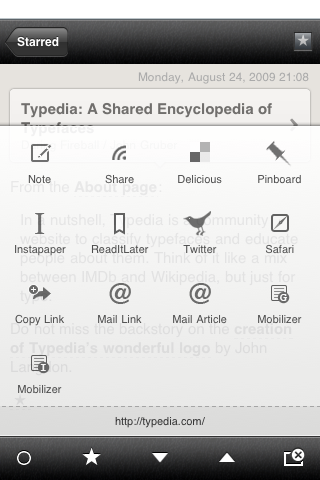 With Instapaper I can grab that content and know that I will get back to it when I review my Instapaper list. So while Delicious is an archive, Instapaper is a transient ‘to-do’ list of items for review. With other content I have a similar breakdown, one archive, one more transient source. For the grab and archive tool Evernote has worked well for me. Like Instapaper it works on my computer and iPhone and it can collect just about anything text, images, audio, and webpages. The next area was the details of email. I am lucky to control a number of domains so I have more flexability in email than most. But with the advent of gmail and other web services with large storage, owning a domain is less of a big deal. Again, since I own my own domains I can have as many emails as I want. I had initially tried to segment my life by creating different emails and using them for different purposes. A general email address for common web use, a personal email of friends and family, and several company emails for business communication. Two problems with this, you have to be disciplined in giving the emails out and you have to rely on others to use them appropriately. That system also ignored the ‘search and find’ routine that unknown contacts will use to find you. So that idea went out the door and I funnel and sort mentality replaced it. Almost all my email traffic funnels to a single account, then that account has some basic filters on what to do with them. As an intermediate state I have a single Gmail account that I can funnel my mail through. I then have 5 other accounts (some Gmail, some not) that I use for specific type if mail. In general my mail runs into 4 piles, excluding spam. The easiest to filter is the high volume listserve traffic. While RSS is okay for ‘news’ some sources of information and discussion are best consumed as an email digest. These are mostly technical and professional forums. Those filter through to a separate account, and then are marked by the list they come from. Some Google Alerts arrive via email also get sorted this way. The second biggest pile is the business communication slightly above the Spam threshold. This is not listserve but it is regular mailings from companies I do business soliciting business or making special offers. I avoid deleting these outright because they are occasionally helpful but it is a high volume, low return pile of data. Typically only look through that when I’m very bored. In a similar pattern to the RSS ideas before, the high volume stuff has been filtered out and the lower volume, higher return communication is left. Most of the last 2 piles stay in my personal mailbox. For lack of a better title, the Household Business mail is the notifications about bills, events, and other items that are important, require action, but seldom have a real person on the other end. Since this information comes from known sources it is easy to create rules to tag those items, leave them unread and await further action at at time of my connivence. The final group is actually the important stuff. Typically this personal correspondence from family and friends. It also does leave items that either don’t have a rule from the 3 items above or aren’t easily classified. There is a little ambiguity there but the volume is sufficiently low that it really isn’t a distraction. One of the items that make the multiple mail accounts a usable idea is an appropriate mail tool. Since I almost exclusively use Gmail for my domains I’ve recently moved to Mailplane to allow an easy way to jump between accounts without the hassle of continually logging in and out of a web identity. It is possible to do similar things with other desktop mail clients but once you commit to Gmail a custom tool that works with Gmail’s quirks is very useful. A little tip here at the end. The other feature of Gmail, and some other mail services, is the ability to create random mail identities. This is done by adding a “+” and any other text after your username. Unless the site does something to strip this out you can actually have unique addresses for any service you subscribe to. Which again makes filtering incoming mail very easy. It also allows tracking of how your email is getting to third parties. I add a timestamp to the email so things like admin@gmail.com becomes admin+1003290820@gmail.com (1003290820 = 2010/03/29 at 8:20AM). I have a little macro that creates these for me. One big area was the issue of how many RSS feeds I was subscribed to. In general the major ‘news’ sources, whether public media (BBC, CBC, NBC, Times) or a specific news ‘vertical’ such as gadget news (Engadget, Gizmodo, TechCrunch), tend to uncover the same stories and you end up with the same basic story in 10-20 different versions. So you are getting a lot of noise for a single piece of information. So I removed the more generic sources from my RSS reader and threw a little logic at it. In this case it was Shaun Inman’s logic through his RSS tool Fever. To make this work you need a server to put this on so this tool is not applicable to everyone. But in general, the idea is to break out the more generic ‘mass market news’ and get it away from the more specialized sources that typically get buried by the high volume sources. Fever boils down the thousands of items in the all those high volume RSS feeds and gives you a top down list of the most popular stories. This provides you a customized filter of all that information which you can further customize by rating your feeds as either “Sparks” – more important feeds, or “Kindling” – less important feeds. So Fever provides you a way to absorb the most common stories. If something really does hit a cord I can email, save, or forward to a number of online sharing service. (More on those services in a later post). That left my main RSS reader (Google Reader) with about 150 feeds down from almost 400. But the important point is only 10 of these average more than 2 posts/day. and the majority are less than 1 post/day on average. So I go from over 1000 items to read a day to less than 400 on a busy day and less than 100 on many days. Google Reader now only has my friends and colleagues blogs, specialty blogs like Flying, Education, and Photography. I also have a few specific searches, mostly from Google Alerts, that produce RSS feeds which are in Reader. While 400 might even sound a bit high, a little workflow is required to manage that many. First the general selection of Google Reader opens the door to a number of ways to read the content. Both on any computer I happen to be in front of (via web interface), on any mobile device via the mobile version of the website, but also via a number of dedicated viewers. I find Google Reader a good experience on my laptop or desktop, the mobile version is not as usable. After a recommendation I tried Reeder for my iPhone. The unique iPhone interface makes it easy to triage RSS items and either mark them Read or Star them with a swipe of your thumb. This is an excellent application and it makes a few minutes in the store line or the time on the treadmill usable for scanning your more specific feeds. Since I might scan my RSS a few times a day, it is seldom that I have more than 20-30 unread items to review. That is totally manageable. Most of the RSS I watch is for general information and to stay on top of new ideas and information. When there is an RSS item that is specifically interest that is when I will use the tools to mark it for follow up at a later time. 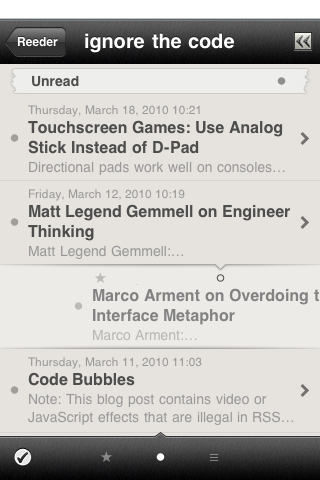 In Google Reader that is by ‘Staring’ the post (hit the S key while viewing) or with similar ease in Reeder on my iPhone. Then once I have time to go to the source and really get into the content I will review the items in my “Starred Items”. This is typically an evening activity at my main computer where I can be more engaged in the content. Once finished the Star comes off. Adding new feeds, if I ever do feel the need to adding a new RSS feed to either Google Reader or Fever both have a bookmarklet that sits in you browser to add the RSS feed from any page to the tool with a click. While that covers most of the RSS content, I will give an honorable mention to Feedly. Feedly provides another interface to you Google Reader feed in a Newspaper style format. It also provides a useful toolbar to email, tweet, bookmark, or share a webpage or feed. The continuing problem of the 3/8″ wrench. Okay no surprise here but I love technology, cool and otherwise. But technology is only useful to the extent it gets something done for you. So I’ve been looking at what I have and how I’ve been using it and it was time for a little Personal Technology Tune-up. There is just way too much information to get interested in everything that comes your way. So after listening to the Mac Power Users Podcast, I went on a little Data diet – sort of. Before I get to what happen, I’ll lay out the punchline first – not the best standup strategy, buy what the hey. You collect applications and services that do things for you and you start trying to use them to THEIR potential rather than YOUR potential. Many would question why have more than one web browser (I have 4), more than one RSS reader (I have 5), and more than one word processor (lost count). The trick is you have different tools for different purposes. A while ago I coined the term “the Problem of the 3/8″ wrench” the fact that many of us buy 101 piece tool sets but typically only use a few pieces on a regular basis. For example I have at least 8 tools that can turn a 3/8″ nut or bolt. Never thought that was excessive. They are different styles of tools for different applications. So with software, you have multiple tools for different types of work. And that’s a good thing. I am constantly amazed how people try to jam all their needs into Word or Excel. That is what they have – forget a database or some other word processor. Even within a software category there are times when you need MS Word for your Master’s thesis and there are times you need TypePad for a blog posting. No shame in that. I think the reluctance is ‘learning’ more software and I understand that. Here’s the problem, when you try to use Tool A for something more easily done by Tool B you will likely spend more time figuring out obscure commands in your current Tool than it would take to get up to speed with a new tool that is a better fit for your task. Take something simple like a web browser. With the expansion of online services where you login once and go many places I have different browsers for different identities. I have a browser for my personal surfing, my Google and Flickr accounts and associated blogging. The bookmarks there point to the places I go personally. Then I have another browser for my hobby blogging where I’m working with community and non-profits. It has separate bookmarks that point to that community and logs into its own blogs, google accounts, and online services. It solves the problem of constantly logging out and into different personas – and the embarrassment of posting a personal comment to a community blog. My RSS feeds have been pruned down to the ones that apply to the different personas and each with there own version of Google reader. Now that is a simple data management problem. Not really different than having two local accounts on your computer. The simplicity of the example masks the power of the method. Going back to word processing, a high end word processor with rulers, styles, footnotes, tables of contents and so on is only really useful when you are creating for print or some other complex document. You can make simpler documents in complex software but why would you? If you are writing a blog post you only need to type plus maybe bold and underline, and be able to save the result – likely as a plain text document. Well you can get through the first part and if the distractions of 147 buttons and toggles don’t bother you every time you look at the top of the window, maybe that’s okay. But then when you hit save, the complexity is right in your face, Export or Save as, find the appropriate drop down. No big deal but why bother? Disambiguating your work is becoming a bigger and bigger part of my workflow. On the computer and on the web there are a massive number of tools many of them are free. The concept of standardization and single choice “best of breed” is something that evolved around supported corporate environments. When you are your own support environment there is no economy of scale. Its seldom that people say nice things about paying there taxes but I have to give some serious credit to Canada Revenue Agency for their e-pass services. E-pass is the federal government’s electronic record service. 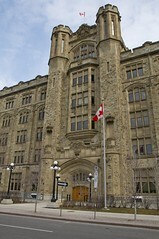 A single account can be used across multiple federal services. Access to each services requires a specific security code that is emailed to your address of record. It isn’t pure two-factor authentication but it is stronger than most online services offered for sensitive records. The fact that the entire process is opt-in for each service you want to enable to your account is also a great feature. What can I do on My Account? formally disputing your assessment or determination. Register: WordCamp Victoria 2009 – WordCamp Victoria (Victoria, BC) – Meetup.com. In slightly more than a tweet, I wanted to plug the upcoming WordCamp Victoria event. After what sounded like an excellent event in Vancouver a couple months ago, some engaging folks on this side of the water have put together an event for Victoria’s Social Media/Networking/Blogging, <Insert additional new media tag here> groups. Watching what gets done right and wrong with various social tools I offer up my three ‘F’s. First it is important to say that Social Media is not a single tool or application. As I got drilled into my head from the likes of Brian Lamb and D’Arcy Norman – its about community. If you are building a social network is needs to be based on the community not the tool. In many cases you will need to multiple tools. FEEDS – you need a syndication, transmission, stream of consciousness that people can latch onto. Provide some thoughts that people can look at. This could be Twitter, an RSS feed, or even a series of emails if that is what it takes to reach your audience. FOCUS – Provide a platform for the community to engage with your content. At this point it could be a blog, but more likely it is a common platform (Facebook, Flickr, Google Groups) that is not seen as being ‘owned’ by an individual. FEEDBACK – The community must see its influence fold back into the content. What’s the use of contributing if it has no effect. This can includes comments in blogs, voicemails played in a podcast, or collaborative content like a Wiki. II. Thou shalt not whine and complain when some people’s crap turns out to be nicer than yours. III. Thou shalt take a moment to consider whether you might be better off just not buying this crap. IV. Thou shalt not blame anyone but thyself if thou misseth out because thou hast not updated thy credit-card info. V. To paraphrase Stephen Stills, shalt thou not get the crap you want, want the crap you get.